This is a set of two Pro-Line Pre-Mounted 30 Series Badlands 2.8 Tires on Desperado Electric Front/Nitro Rear Wheels, and are intended for use on the rear of the Traxxas Jato, Nitro Stampede and Nitro Rustler trucks, as well as the front of the Traxxas Electric Stampede, Rustler and front/rear of the Stampede 4x4. For all you Traxxas Stampede and Stampede 4X4 fans the wait is over for an all-terrain and aggressive 5" tire. 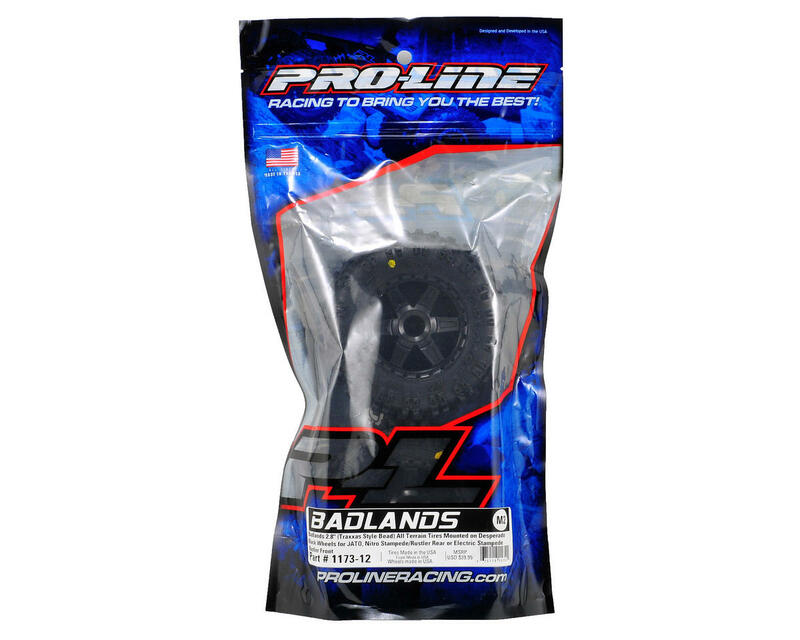 The Badlands tire offers motocross style tread mounted on Desperado 2.8” wheels. It is made strictly for the MX'er in you. Its oversized lugs offer you the ultimate in grass and dirt shredding performance under all-terrain conditions. 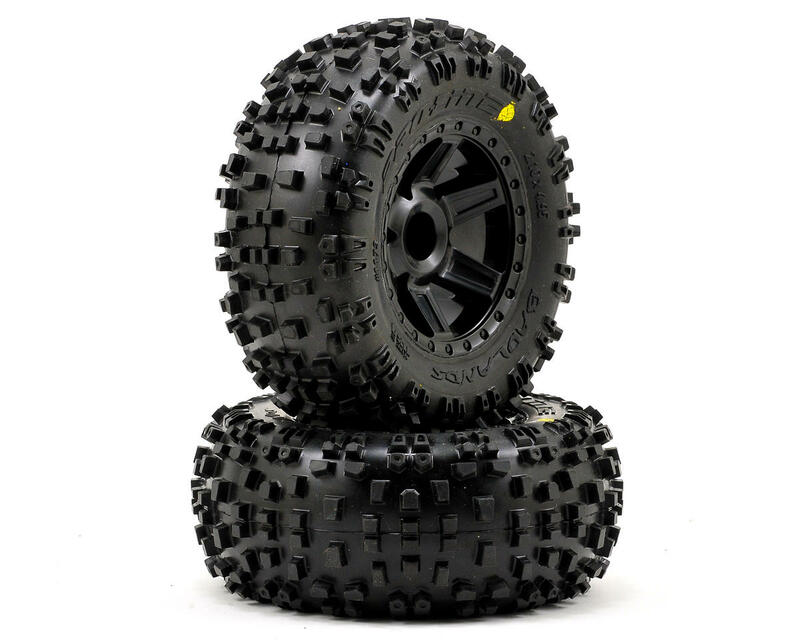 This tire will also work on your Traxxas Rustler or JATO, if you are looking for a huge tire. I just put these on my Slash 4x4. I use them for bashing on medium to light packed snow. They are amazing! Best tire I've tried on mentioned surfaces. After four runs at 45 minutes each, I have been on blacktop road, grass(tall & short), dirt, gravel, and a loose mix of all of the above. These tires are great. I get a controlled wheelspin in the loose stuff and lots of grip on road and grass. I'm driving a Rustler/12T Titan/4200NiMH/stock gearing combo and having a good time. They stick out further than I wanted, but that's not a complaint now that I pulled a 100ft wheel in the grass. I don't play in the mud, so no idea how they do in that kind of mess.